The Ping Cadence TR putter models utilize different weight face inserts to provide the right fit for golfers swing tempo, which is key to a consistent putting stroke. The traditional models have a blue grip and a blue aluminum face insert and is designed for a faster tempo stroke. The heavy models have a black grip and a black steel insert and are designed for a slower tempo stroke. The Cadence TR putters have the next generation True Roll technology grooves that vary in width and depth for ball speed consistency and accuracy and are precision-milled directly into the face. 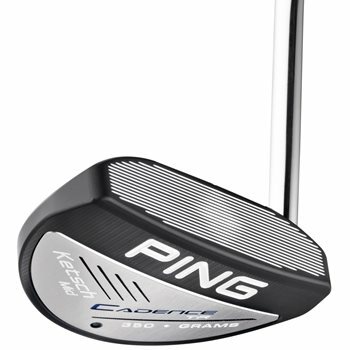 The Ketsch Mid is optimal for players with a slight arc, strong arc or straight putting stroke. Ketsch Mid traditional and heavy models are distinguished by the weight of their sole plates (350g and 375g). is the 36 " model the heavy or traditional Thanks ?